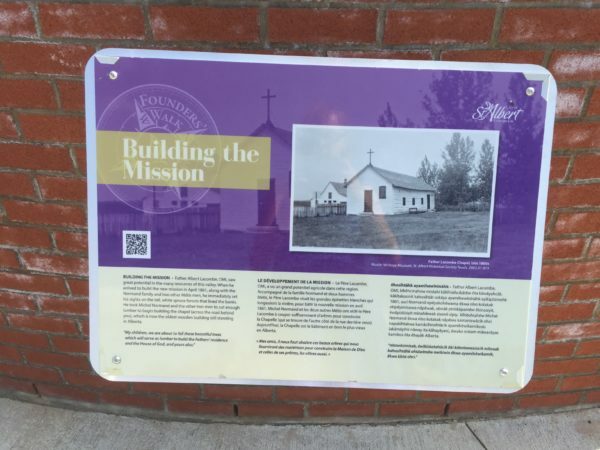 Father Albert Lacombe, OMI, saw great potential in the many resources of this valley. When he arrived to build the new mission in April 1861, along with the Normand family and two other Métis men, he immediately set his sights on the tall, white spruce forests that lined the banks. He took Michel Normand and the other two men to cut enough lumber to begin building the chapel (across the road behind you), which is now the oldest wooden building still standing in Alberta. 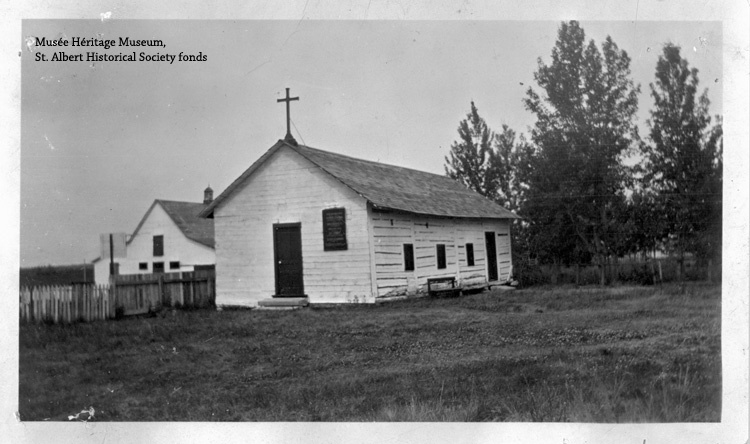 Father Lacombe Chapel, [1861 – 189-]. Le Père Lacombe, OMI, a vu un grand potentiel agricole dans cette région. Accompagné de la famille Normand et deux homes Métis, le Père Lacombe visait les grandes épinettes blanches qui longeaient la rivière, pour bâtir la nouvelle mission en avril 1861. Michel Normand et les deux autres Métis ont aidé le Père Lacombe à couper suffisamment d’arbres pour construire la Chapelle (qui se trouve de l’autre côté de la rue derrière vous). Aujourd’hui, la Chapelle est le bâtiment en bois le plus vieux en Alberta. Father Albert Lacombe, OMI, kîkêhcinahow mistahi kâkîhisihcikâtêw ôta kâwâyahcâk. kâkîtakosinit kahosihtât oskâya ayamihewînînâhk ayîkipîsimohk 1861, asci Normand opêyakohêwama êkwa nîso kotakak otipêyimisowa nâpêwak, sêmâk pisiskâpamêw êkinosiyit, êwâpiskisiyit minahikwak sisonê sîpiy. kîhitohtahêw Michel Normand êkwa nîso kotakak nâpêwa kamaniswâcik ohci napakihtakwa kamâcihosihtâcik ayamihêwikamikosis (akâmâyihk nâway ita kâhayâyan), êwako nistam mâwacêyas kamikos ôta êhayâk Alberta.